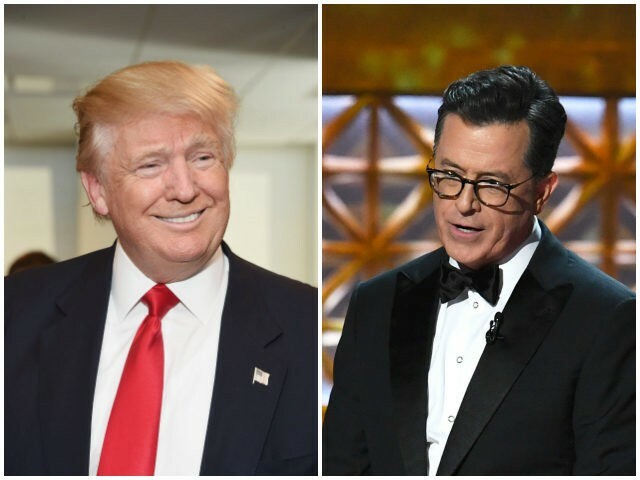 President Donald Trump mocked the low-rated Emmy Awards broadcast, where host Stephen Colbert and multiple television celebrities repeatedly mocked and condemned the president. “I was saddened to see how bad the ratings were on the Emmys last night – the worst ever,” Trump wrote on Twitter. I was saddened to see how bad the ratings were on the Emmys last night – the worst ever. Smartest people of them all are the "DEPLORABLES." The president praised his supporters, many of whom boycotted the show. “Smartest people of them all are the “DEPLORABLES,” he wrote. The 69th Primetime Emmy Awards garnered 11.38 million viewers according to Deadline Hollywood — effectively tying the show’s bleak 2016 ratings. Host Stephen Colbert and many of the celebrities at the awards referred to Trump in at least 34 direct and indirect references, according to the Washington Free Beacon.